There’s bad times a-brewin’ between two former Charmed costars, and it’s over one of the most contentious of issues we’re currently facing as a society: sexual assault and, to a lesser degree, how the women frequently connected to the men who have abused their power should be treated. 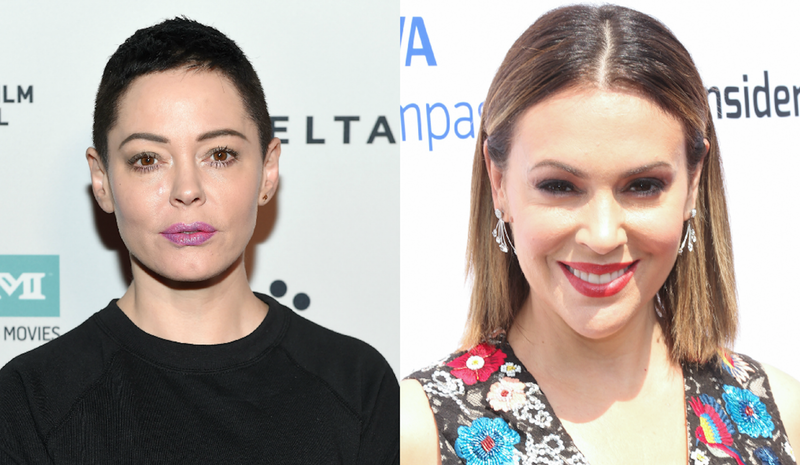 For Rose McGowan, a leading voice in the charge to eradicate sexual abusers and predators in Hollywood, it would appear there’s one woman she cannot support in this charge, and the rest of the world found out who it was on Twitter thanks to the comments of her Charmed costar Alyssa Milano. On Dec. 8, McGowan tweeted out, “You make me want to vomit. You actually gave me a body flashback. Well done, fake one – People.” At first blush, it seems like McGowan is calling out People magazine itself for posting an article supporting Georgina Chapman, Harvey Weinstein’s soon-to-be ex-wife who swiftly separated herself from and denounced Weinstein in the wake of revelations about his sexually abusive actions against other women over the last few decades. However, shortly after that first tweet, McGowan wrote a second tweet. Here, the Milano connection becomes clear. “Alyssa, maybe you and Georgina can call up Camille Cosby,” she wrote about an hour later, directly calling out Milano for voicing her support of Chapman during her separation from Weinstein and imaginably suffering the slings and arrows of being connected to a man who has truly committed horrific acts of sexual assault and harassment. The People article in question reports on Milano offering a status update about Chapman to Today cohost Megyn Kelly just two months after the news about Weinstein broke. Milano has been a longtime friend of the socialite and fashion designer, so you can imagine how she’d be able to provide some insight. “Georgina is doing very well. She’s an amazing mother. She’s an amazing woman, and I think her priority right now is focusing on how to raise those two children to the best of her capacity given the situation,” Milano said. While McGowan didn’t offer up an explanation in her own words, it would appear that her retweeting of another user’s comment acts as her own statement about her disappointment with Milano and subsequently with Chapman. You see, for McGowan, there’s still the massive issue of complicity on Chapman’s part. It would seem McGowan, who has alleged that Weinstein raped her, cannot feel any sympathy for a woman who may have known about her husband’s actions. Milano still has yet to respond to McGowan’s vitriolic comments about her support of an allegedly complicit woman, but I doubt this is the last we’ll hear on this matter. McGowan is nothing if not ferociously persistent about calling out people she believes are in the wrong; Milano may want to take care.